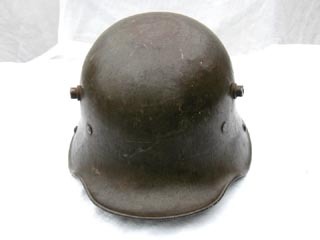 This section is to help beginning collectors and other interested people determine the differences in the variety of German helmets and recognize some of the helmets that can be mistaken for German helmets. Our intent is to give you an overall understanding of the basics. It is not intended to teach you everything you’ll ever need to know. WW-1 started with headgear being little more than decoration. The French appear to have been the first to try protective headgear, but at about the same time all of the primary participants began issuing steel helmets. 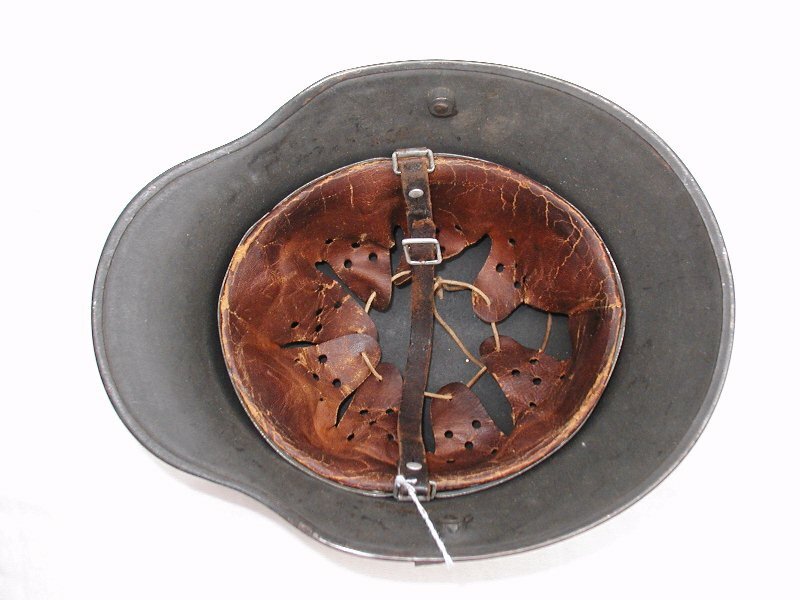 The intent of these helmets was to protect the wearer from shrapnel and debris. They were not intended to stop bullets. The German Army introduced their steel protective helmet in 1916, therefore called the Model-16 (M-16). Each primary change resulted in a change of the numeric digit reflecting the year of the change. M-16: Three pad leather liner, on a leather band. Leather chinstrap attaches to fixed lugs on the inside of helmet near each ear. The extended vent lug doubles as a bracket for a heavy front plate that was bullet proof. An original plate is very rare but reproductions are commonly available. The vent lug is slightly different on each size of helmet so that one plate fits all size helmets. M-17: Same as M-16 except the liner band is now steel rather than leather. If the liner is missing there is no way to determine if it was originally an M-16 or M-17. M-18: Change in liner and chinstrap attachment. Liner still three pad, with steel band. Chinstrap is now attached to the liner band, and the chinstrap lugs are gone from the helmet skirt. It is apparent from the outside that there is no chinstrap lug on this M-18 helmet. The camo paint can be found on M-16 and M-17 as well. 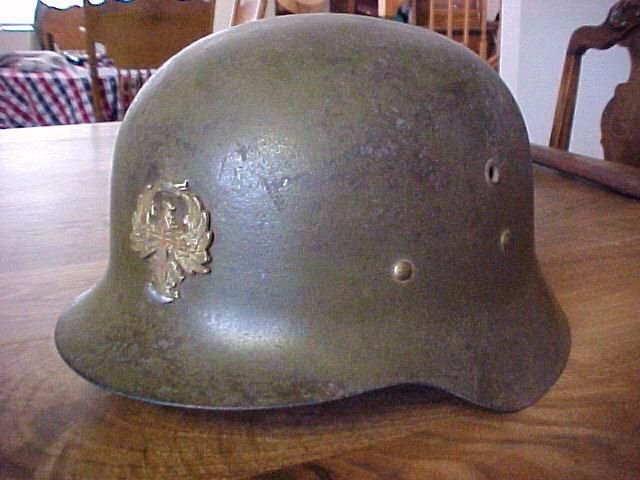 Austrian M-17: Closely allied with Germany, the Austrian helmet is very similar in design. The Apparent differences are color and chinstrap attachments. 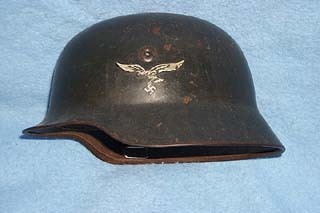 The Austrian helmet was issued in Brown, rather than German Green. The chinstrap is canvas and is sewn onto the rings. Some WW-1 shells were reissued as police helmets. But the Typical police helmets are the M-34 style. These are only somewhat similar in style to the combat helmets. But are a light duty helmet with a different style liner and noticeably different vents. Typically a double decal helmet, with one of the decals being the jurisdiction of the police officer early, or the tri-color shield on later helmets. Transitional Helmet is the name given to any WW-1 Helmet that was refitted with the new 1931 model liner system. These helmets were issued in the pre-war build up period and began to give way to the new helmet in 1935, although to varying degrees WW-1 shells were reconditioned and issued until the end of the war. Paint and liner vintage will tell if it was from the pre-war buildup or furnished during the conflict. 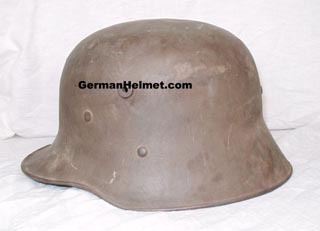 M-35: In 1935 the new helmet was introduced. It had a shorter skirt than the WW-1 models, and the vent lugs were reduced significantly in size. The vent piece continued to be a separate piece inserted into the shell. This helmet utilized the 1931 model liner system made of aluminum with the noticeably square cast aluminum chinstrap rings. M-40: In 1940 two changes occurred. The vent was no longer made from a separate piece, It is now simply pressed into the steel of the helmet shell. The second change was the liner band now being zinc coated steel The chinstrap rings are now bent steel rather than cast aluminum. A third change that occurred at about the same time is the paint, which we will discuss in a moment. M-42: In 1942 the edge of the shell was flared out, rather than rolled under. Other signs of cost saving and rushed production appear in M-42’s but are not relevant to its identification or value. 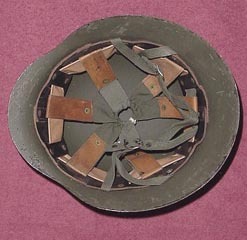 Paratrooper Helmet: The shell of this helmet is basically a chopped down M-35. However, Except for the very early production, the vents and liner are entirely different from the M-35. There is far more to know about paratrooper helmets than this. It is important to know that paratrooper helmets have been reproduced in great numbers and reproductions are better each year. Paint: Pre-war and very early war paint was a smooth finish, lighter shade of green called “apple green". About the time of the change to M-40 the paint changed to a textured darker green. Although shades of this color shifted slightly between batches and from factory to factory there were no formal changes in paint or color through out the war. The green helmets are army and Waffen SS. 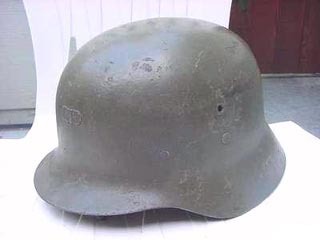 Luftwaffe helmets are gray following the same pattern of smooth early and textured around 1940 with only slight variations after 1940. Greater variations appear in helmets today as the individual storage environment has affect each helmet differently. 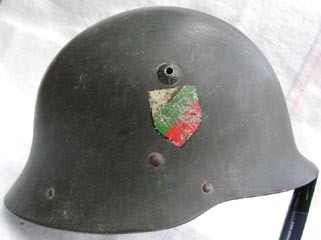 Decals: Pre-war transitional helmets, and a large percentage of M-35’s were issued with two decals. The Army/Navy/Air Force decal on the left side and the tri-color country shield decal on the right. About the time the war began the tri-color decal was discontinued and soldiers were instructed to remove or paint over that decal on helmets in use. 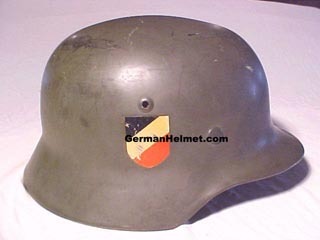 Far more Luftwaffe helmets avoided the removal of the tri-color decal as they were not in combat areas. At some point in 1942 the application of any decal was discontinued, with the exception of some waffen SS and Air Force (Luftwaffe) who continued to decal until near the end of the war. There were variations of decals, including hand paint insignia from the Reichswehr period (Freikorps) prior to the Nazis gaining power, but true examples are rarely found. Luftschutz was civil defense. These helmets were issued to old men and children who were tasked with various “defense” duties and bomb disaster work. 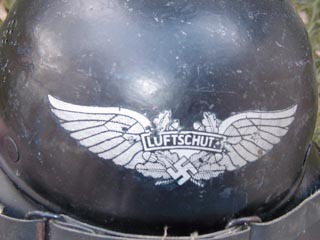 The typical Luftschutz helmets were the Gladiator style. There were three variations of this helmet. 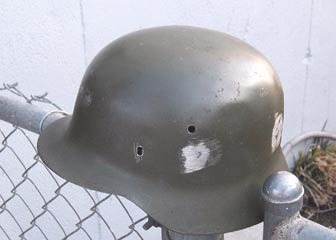 Also used were M-35/40/42 “beaded helmets” which are believed to be quality control rejects of combat helmets, that were re-worked adding a swelled ring around the helmet to easily identify it as inferior. 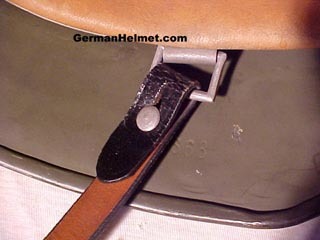 Most Luftschutz helmets have inexpensive liners. 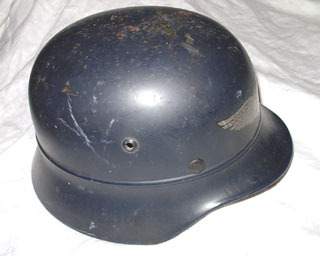 It is rare to find a 1931 style liner in any Luftschutz helmet. 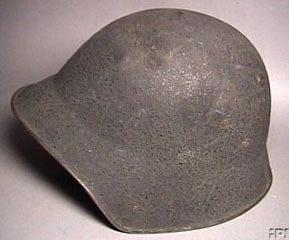 Luftschutz also made use of many other helmets, such as captured enemy helmets. These were produced for West German boarder guard use. The quality is very low and the liner is very simple. There were variations of these helmets. 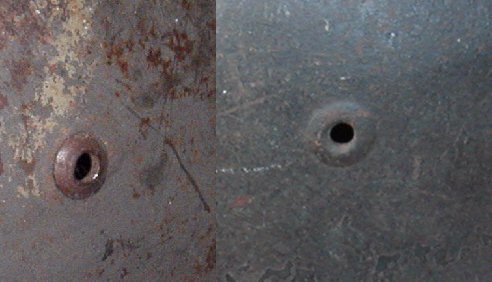 Some are easy to spot because of the liner rivets and/or vent lugs are not present. 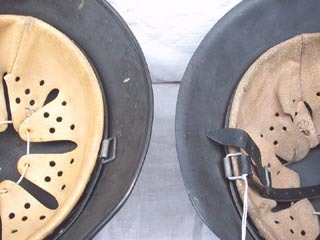 However, the earliest postwar helmets are the same in appearance as the wartime production. Easiest way to tell? 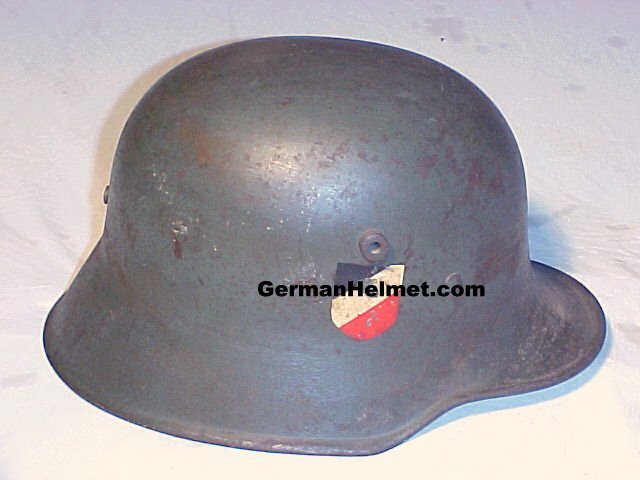 If the helmet retains it original paint, it will be pretty obvious it is not WW-2. Also, the post war will not have a batch number (4562) stamped into the helmet skirt, they only have the maker and size stamp (Q64). 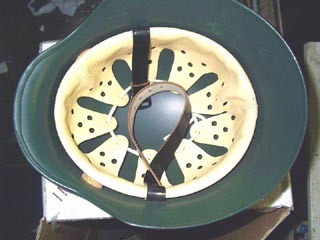 If a 1931 model liner is put into a postwar helmet you will quickly realize that the placement of the front liner holes is slightly lower, exposing a large portion of the liner band in front. Notice the single band liner system offset from the shell with cork washers. The chinstrap is sewn to the side of the liner. There are other variations of the postwar liner system. This postwar model uses a liner that attached to the top of the shell. Notice there are no liner pins on this one. The Luftwaffe decal is a modern reproduction. Ranking up there with “the check is in the mail” is “Made on German equipment for the Spanish army” or any other statement tying the Spanish Modelo helmet to Germany. 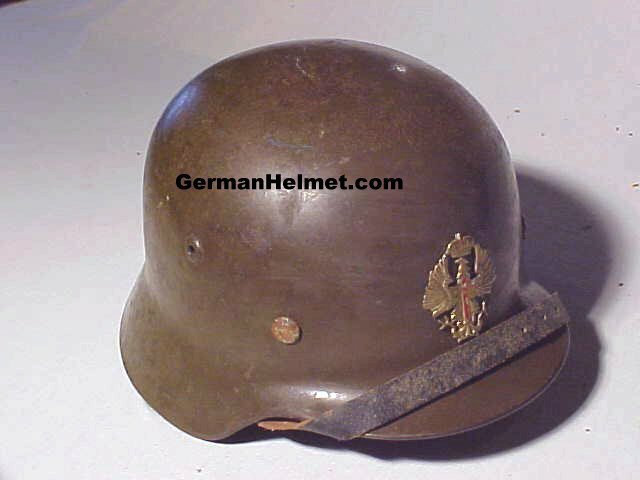 During the Spanish civil war the Franco regime did in fact buy a number of German Helmets. 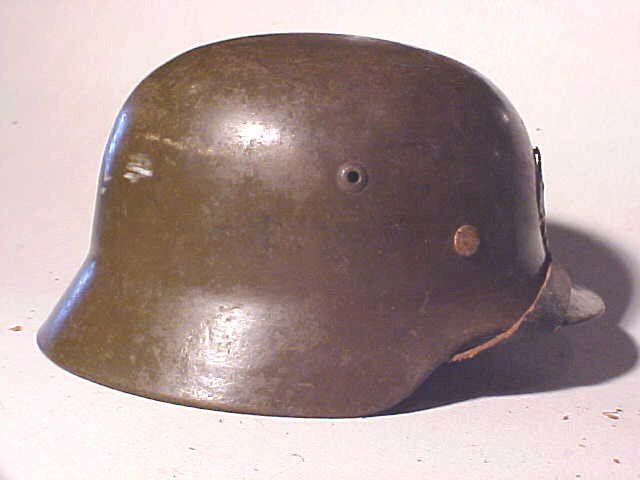 These helmets were the standard German made M-35 with a front bracket added. A few years after the end of the Spanish civil war, Spain began producing a helmet called the “Modelo”. It was copied in style from the M-35. However, a simple test with a hammer may suggest that the Modelo has more in common with a tin can than a real German helmet. The early Modelo had a crude three pad leather liner, later a canvas style liner. Easiest way to distinguish is the insignia bracket on the front and seven, rather than three, liner rivers. Also the rivets heads are much smaller in size. 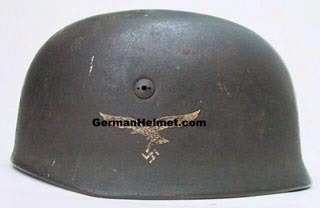 Some Spanish helmets have been converted to looks more like the German Helmet, so the most sure identification is that a German M-35 and 40 have the edge rolled under and an M-42 flares out. The Modelo ends straight neither rolling under or flaring out. German made M-35 purchased by spain. The only difference is color and the addition of a bracket for the insignia on the front. Liner is a standard 1931 style. Spanish made Modelo notice the extra rivets and small physical size. Spanish helmet as typically found today. 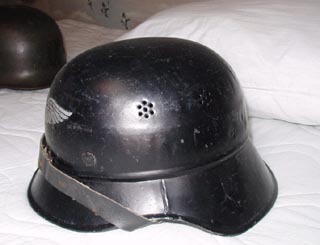 This helmet was in the process of being converted to look more like a German M-42. The owner probably realized that after all that work it would still not be a German helmet and gave up. This is the most common liner found in a Spanish made helmet.